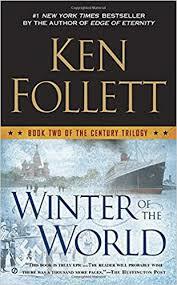 Second installment of Ken Follett's Century Trilogy, Winter of the World continues the histrionics of the five families introduced in Fall of Giants in 1933 Germany. ...it dispenses with some of the waxenness of its 985-page predecessor and breathes life into its fictional characters, many of whose parents appeared in the first book ... Winter of the World (covering 1933 to 1949) less strenuously views history through the eyes of purely fictional characters, dim though they may be ... But Mr. Follett is best appreciated as a novelist, not a historian. What he knows how to do is put readers’ hearts in throats...best of this book, the latter half, is as gripping as it is manipulative. It makes the biggest tectonic shifts of its era — the struggle between Communism and Fascism, the irreversible march of science toward nuclear weapons, the laying of groundwork for the coming cold war — feel momentous indeed ...it would be surprising if this second installment did not prove to be the most powerful part of Mr. Follett’s trilogy. Winter of the World, the equally massive second volume of the trilogy, opens in the critical year of 1933. Against the backdrop of a worldwide Depression that has resulted in widespread unemployment, Hitler and his party assume complete control over Germany ...dramatizes the major ideological conflicts that marked the first half of a turbulent century, moving from Germany under the Third Reich to the battlegrounds of the Spanish Civil War to the Russia of Joseph Stalin...the real centerpiece of the narrative, a sustained sequence that occupies fully two-thirds of its considerable length, is Follett’s chronological, highly selective re-creation of World War II ... In several sections of the novel, Follett returns to his roots as a thriller writer, focusing on the role that espionage played in the conduct of the war ... Follett’s real gifts are those of a natural storyteller. Much like the previous installment, Winter of the World clips along at a brisk pace. The historical novel takes readers inside the political battles and atrocities of Nazi-era Germany, fascists fighting a motley crew of European rebels in the Spanish Civil War, and disillusionment spanning the governments of Stalin’s Russia ...begins in 1933 with the rise of Hitler and ends in the Cold War nuclear age. In between, the families, hailing from Russia, the United States, England, Germany, and Wales mingle with real characters, including FDR and Harry Truman ... At times, Follett falls into the trap of relying too much on dialogue to convey historical context ...Follett keeps his characters interesting – and moving. Despite the length of the book, the author is well-served by his earlier role churning out tidy thrillers ... No matter the ultimate destination, readers can expect to savor the journey – and agonize while waiting for the final book to arrive. What did you think of Winter of the World?